Fox Glacier - Westland National Park. 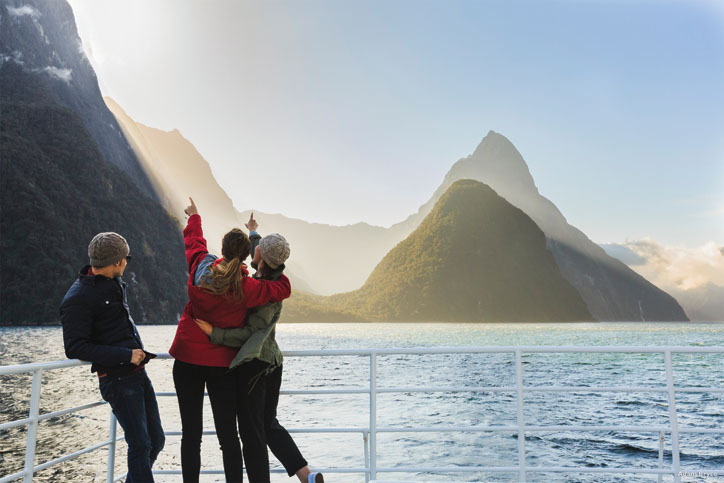 See the North and South Island including Bay of Islands, Auckland, Rotorua, Christchurch, Queenstown, Milford Sound and more, on AAT Kings' low cost New Zealand Magic tour. On arrival in Christchurch you will be transferred from the airport to your hotel. Meet your Tour Director and fellow travellers for a welcome drink and dinner. 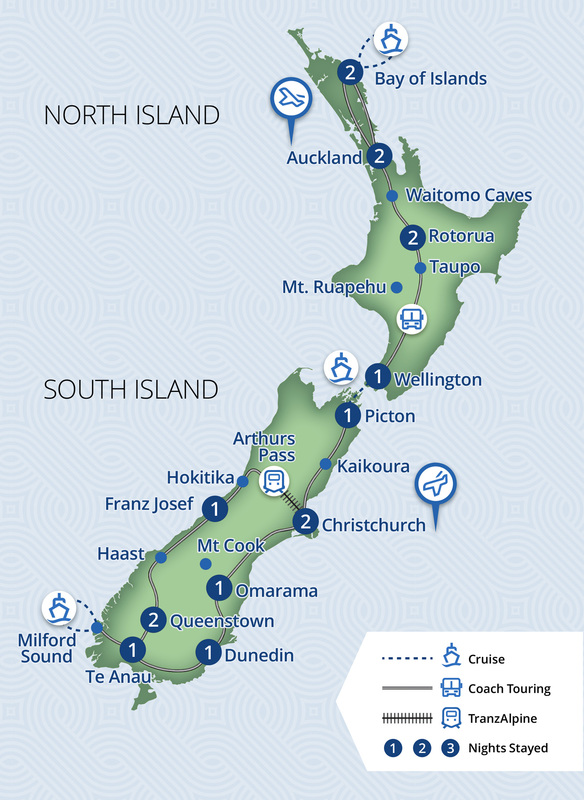 First up this morning you’ll board the TranzAlpine, one of the top scenic train journeys in the world. 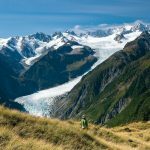 This spectacular trip takes you across the Canterbury Plains and through the Southern Alps to Arthur’s Pass. Later visit Hokitika, home of pounamu (jade), for a studio visit and jewellery demonstration. 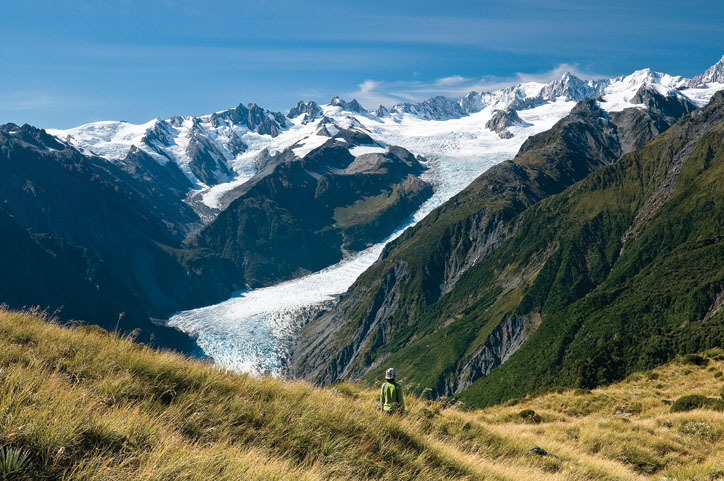 Next stop is Franz Josef Glacier – a rare, still advancing glacier (optional scenic flight available). 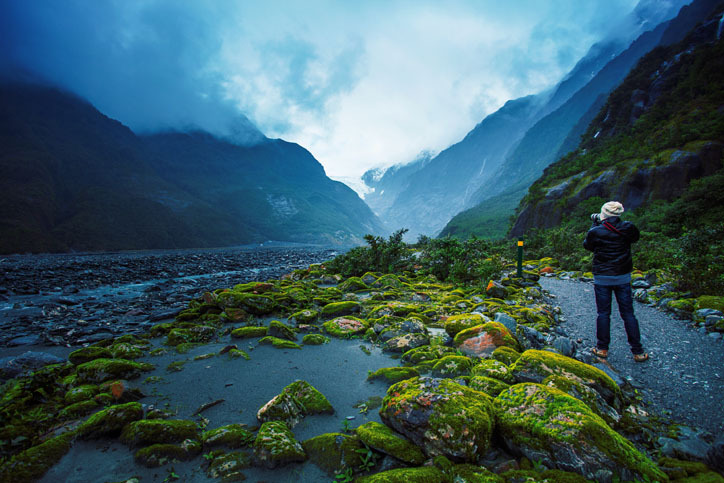 Travel through the Haast Pass, view Thunder Creek Falls, take a rainforest walk. Then it’s a trio of lakes – Wanaka, Hawea, and Dunstan. Next is Cromwell and its stone fruit and Arrowtown on the Arrow River. 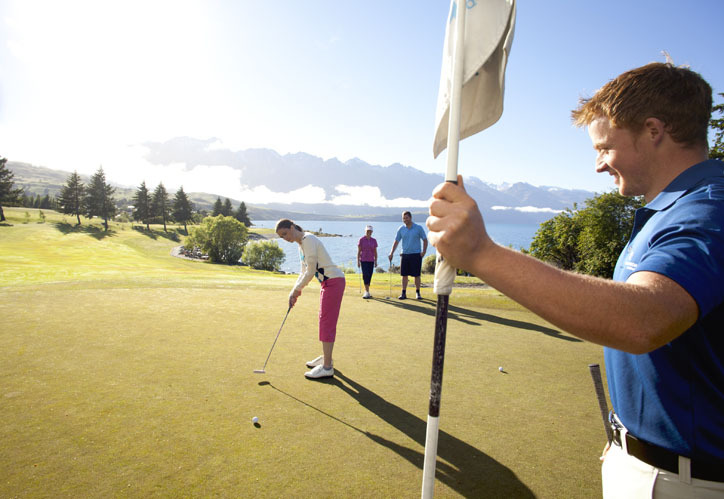 On arrival in Queenstown, the ‘adventure capital of New Zealand’, an orientation tour completes your day. 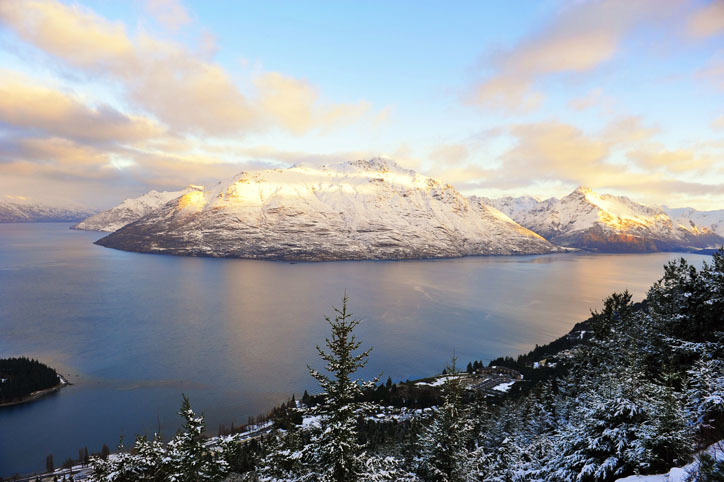 Travel along the Devil’s Staircase and the shores of Lake Wakatipu to Te Anau. 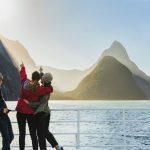 You’ll be awestruck by great sights from Fiordland National Park to Milford Sound, one of the world’s most amazing places, where you’ll cruise on the waters of this natural wonder. 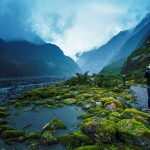 En route you’ll drive through the handmade Homer Tunnel to the abundant photo opportunities afforded by the Mirror Lakes, Pop’s Lookout, Cleddau Valley, The Chasm, Mitre Peak and Bowen Falls. Then return to Te Anau. 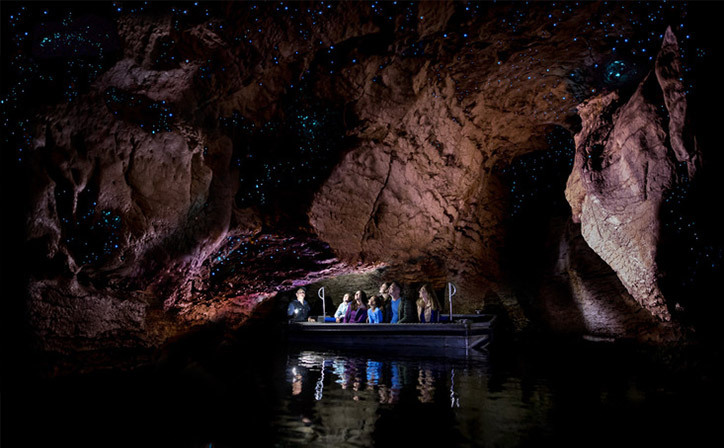 Tonight you have the option to visit the Te Anau Glowworm Caves. We’ll cross sheep-filled farming land to Dunedin, founded by Scottish settlers, for a city tour. 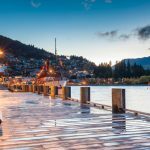 The afternoon is yours to explore Dunedin as you wish – take a wildlife cruise, visit Cadbury World, or ride the historic Taieri Gorge Railway. Enjoy a morning of time to yourself and the opportunity to visit historic Larnach Castle, New Zealand’s only authentic castle, Travel through Ōamaru which is famous for its limestone buildings, then follow the Waitaki River, passing hydro-electric dams at Waitaki and Aviemore, on to Ōmarama. Soak up the alpine scenery of Aoraki Mount Cook National Park, home to New Zealand’s highest mountain. 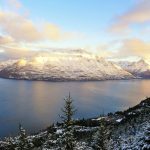 You may wish to take an optional scenic flight (weather permitting). This afternoon stop at Lake Tekapo and view the Church of the Good Shepherd, then continue over the colourful Canterbury Plains to Christchurch. Travel along the rugged Pacific Ocean coast to Kaikōura, famous for its whales (optional whale watching flight). We’ll get up close and personal with some New Zealand fur seals at Ōhau Point. 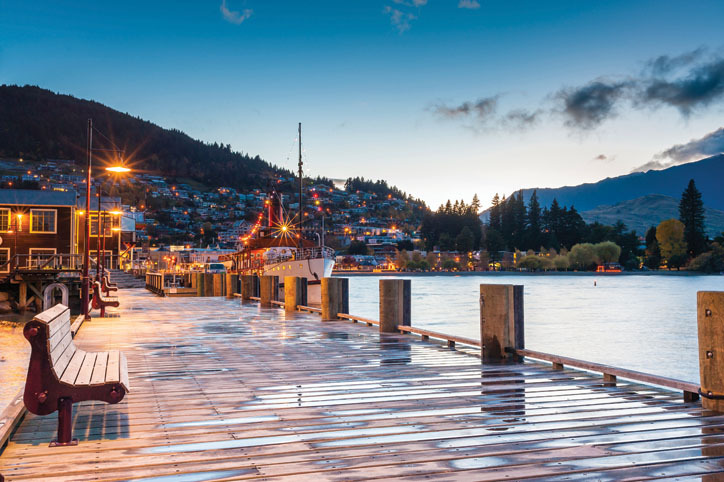 Pass the Grassmere Salt Works then travel to the pretty seaside town of Picton. 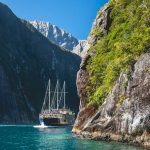 Cruise on Queen Charlotte Sound and across Cook Strait to Wellington for a city tour with views from Mount Victoria. Enjoy free time and then we visit Te Papa Tongarewa, Museum of New Zealand. Tonight experience the local cuisine for yourself. 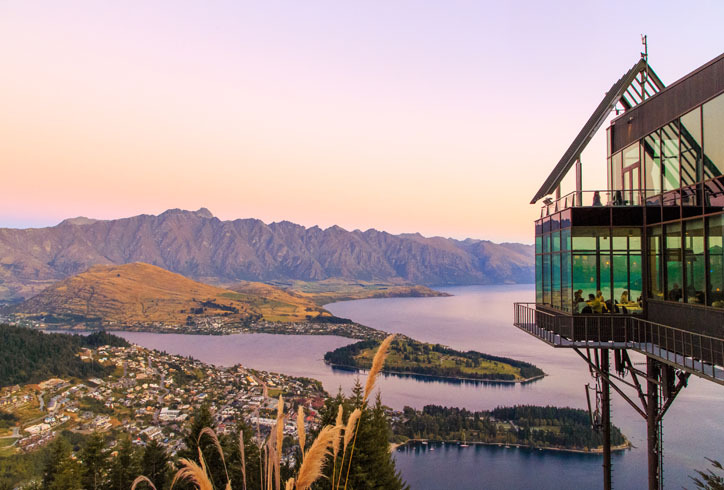 Travel along the Kapiti Coast, through the dairy farms of Manawatu, to Tongariro National Park and discover the alpine scenery of Mount Ruapehu. 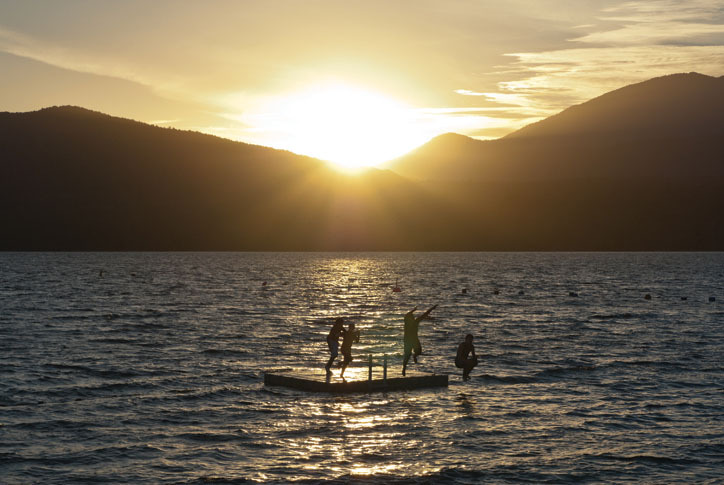 Visit Taupō and drive along the shores of New Zealand’s largest lake. View Huka Falls and pass the Wairakei geothermal power station. Travel over the Auckland Harbour Bridge, through Orewa and the scenic Hibiscus Coast. Walk amongst kauri trees at Parry Kauri Park. There’s time to explore Whangarei, the northernmost city in New Zealand, then it’s off to the beautiful Bay of Islands. Take a scenic cruise through game fishing waters to Cape Brett and, weather permitting, through the famous Hole in the Rock formation. 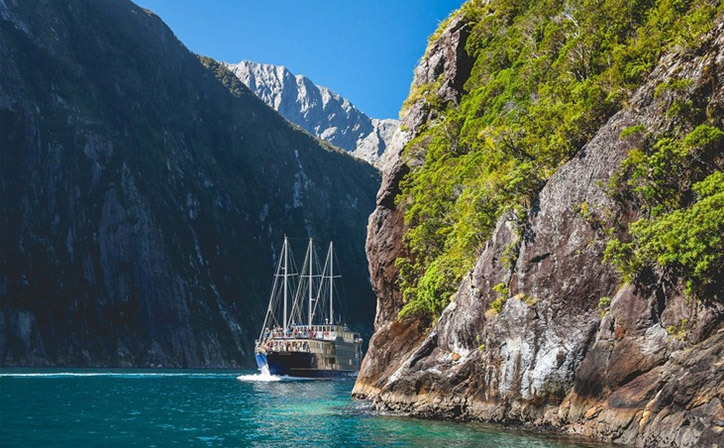 The return cruise to Paihia meanders through picturesque islands – see deserted sandy beaches and secluded bays and keep your eyes peeled for the marine life. You have the opportunity to visit the historic Waitangi Treaty Grounds, where New Zealand’s founding document was signed. 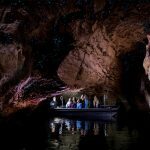 You’ll have time on your own to take in highlights such as the magnificent Ceremonial War Canoe (waka) and carved meeting house (Te Whare Rūnanga). This afternoon enjoy the lush farmland scenery as you return to Auckland. 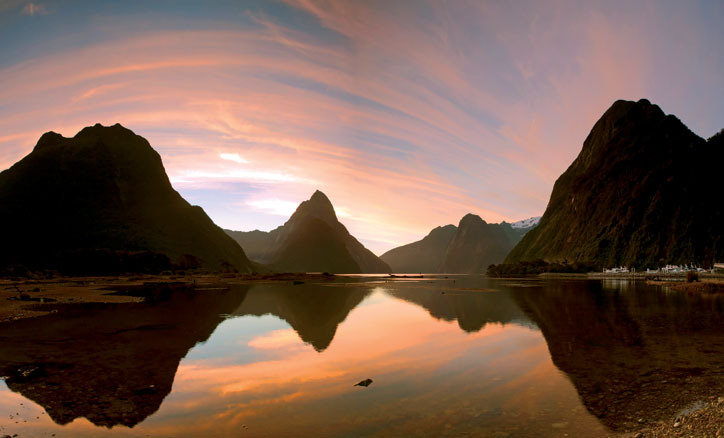 I just wanted to thank you for your assistance in booking our coach tour of New Zealand with AAT Kings. Thanks to your organisation everything went as clockwork with regard to the airport transfers and the 2 extra nights accommodation. The tour was hectic but it needs to be to cover as much as it does. I would recommend this tour to anyone who wants to see as much of New Zealand as possible in a little over 2 weeks. We thought the tour was very well planned and everything was well executed. Great trip, would use Relaxing Journeys again. We really enjoyed the trip and had a great time. The only thing we thought could have been improved was the optional extras. 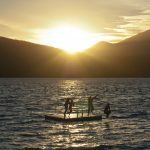 Being winter, the shorter daylight hours made it difficult and in some instances, impossible to offer some of the activities. It was not until we were on tour that this became apparent - however, this could be an oversight on my part and perhaps I didn't read the information thoroughly enough. We enjoyed our NZ experience very much. Our tour director, Clarke Hitori, was very helpful and accommodating to travellers' needs, and taught us much about NZ and Maori culture. He took good care of all of us! Pat O'Regan was an experienced driver, and always felt safe in his hands. Kia Ora. We both loved the tour. It was well organized and yet gave us free time in a number of places. Mark, our tour Director, was extremely knowledgeable and loved showing you his country. The only down side was that Mark talked a bit too much which ended up making you tune out, and possibly miss some of the more important information. Our coach driver, Trent, was fantastic. He was an extremely good driver, especially considering the size of the coach we were on (a 39 seater) and the narrow roads through most of the country. Both of the guys were extremely great in helping people off the coach and doing everything that they could possibly do to make our trip fantastic. We also appreciated the fact that the start times were not too early. I had a great time on the tour! I would highly recommend it. I did say that several of the accommodations were not so nice but that was balanced out by those locations that were excellent - like the Bay of Islands. The other mention is the fabulous tour director who was spot on at all times, willing to share his experience in life, knowledge of his country and heritage. Thanks again Vale! Perhaps the pace was a bit fast but that is expected in a 17 day tour. I would recommend the longer ones when a bit more time is allowed in some of the stops. I would travel again with AAT Kings. I thoroughly enjoyed the tour. The tour leader has a lovely personality and made everybody feel good and happy. The driver was very cautious on the roads, very polite and knowledgeable on every topic. 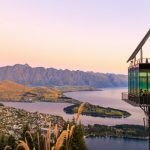 I can recommend this tour to everybody wanting to travel to New Zealand. Tour Manager and Driver were really helpful and informative. The actual tour covered a good breadth of what NZ has to offer. The scenery was simply breath taking. Everything seemed to be handled and organised which meant no stress on my part. I loved it! Excellent tour. 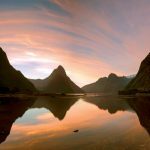 If like me you want to see as much of New Zealand as possible as it is a once in a lifetime trip, as it was for me, this is the tour for you. Rather hectic at times. New Zealand is a beautiful country. I went on a Jet boat and on a helicopter ride not bad for someone who is nearly 80! At the other end of the scale my 7 year old grandson thoroughly enjoyed the trip especially the trip to the Maori Village. Our Tour Director Alan and our driver Val were both excellent and extremely knowledgeable and helpful. I would thoroughly recommend this tour which was very well organised. Hope this is helpful.